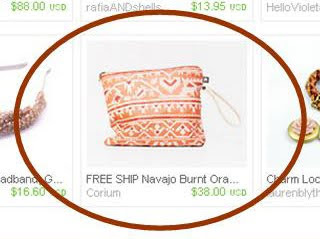 BEYOND BUCKSKIN: Does Etsy Condone Trademark Violation? 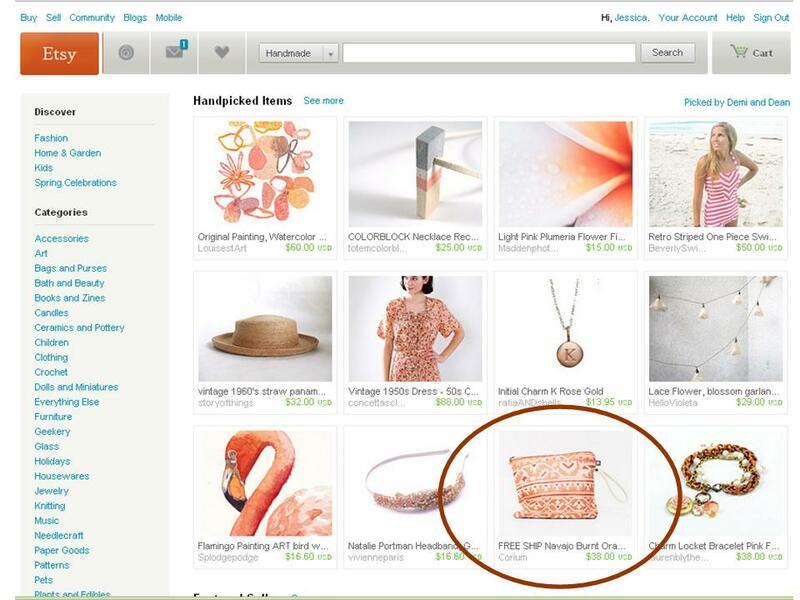 Does Etsy Condone Trademark Violation? So, if you haven't heard, the Navajo Nation is suing Urban Outfitters over product names (read more here and here). I completely support the Navajo Nation on this one (it's straight up trademark violation in my eyes) and I'm interested to see how Urban Outfitters responds. Well, when I heard about this lawsuit, I remembered that a high number of "Navajo" products were being sold on Etsy (3,503 items, to be exact). On Etsy's front page featured list was a 'Navajo' purse that was 'handpicked' by 'Demi and Dean' (who are artists based out of California). The purse is not made by a Navajo artist. You should not condone illegal sales activities on your site and you should not promote items that violate trademark laws and/or the federal Indian Arts and Crafts Act. Let's see if I get a response. If Etsy receives notice from the authorities that a member's content or activity on our site does not comply with the law, then we will remove it and/or take measures to comply with the law. Beyond legal issues, it's up to each member to make important ethical and moral decisions about what they choose to buy and sell on Etsy. You should have told them also that it violates the Indian Arts and Crafts Act of 1990. It seems more their playground. It is illegal to market an art or craft item using the name of a tribe if a member, or certified Indian artisan, of that tribe did not actually create the art or craft item. What if you sent that letter to the seller? I saw that listing too and was frustrated and sent a message to the seller. She calles it Navajo in the title and then says it's made from vintage Indian saris... I mean, at least attempt to stay on the same appropriating page! I actually just got another letter from 'Nick' at Etsy saying that I cannot send a message to the seller: "Please know that sending unsolicited messages to other members may be considered spam. Please do not send these types of messages through Etsy's Conversations system. Conversations were designed to handle transaction arrangements." So, I can't contact Etsy, and I can't contact the sellers, so that leaves the Indian Arts and Crafts Board who oversees the IACA. I just reported a violation: http://www.iacb.doi.gov/file.html. It was fast and easy. We'll see what happens. Have you tried contacting the Navajo nation about this as well as the IACA? I've known some Etsy sellers who's items were quickly taken down when (presumably) the company received notification from the trademark holders that there were infringing items on the site. My guess is that there are people at Etsy who may understand your concerns, however, the company legally needs to hear from the actual trademark holders to do anything. Best of luck! Well, I'm late to this. But yeah, the legal burden to enforce copyright/trademark infringement is on the rights holder. So the rights holder has to tell Etsy to take a listing down in order for them to comply. The best way to report somebody is to go straight to the rights holder, and let them send the cease and desist. Etsy just listed another front page treasury with 2 Navajo items. I made a comment in the comments section about their illegal use of Navajo. It seems to me that even though the ethical decision falls on the shoulders of the seller, Etsy has responsibility once they promote that item on the front page. It says to me that they are endorsing the illegal behavior of the seller. Also, I'm sure Etsy would not promote an item on the front page called "Gucci purse" if it was not Gucci--but just some handmade purse by a random seller.